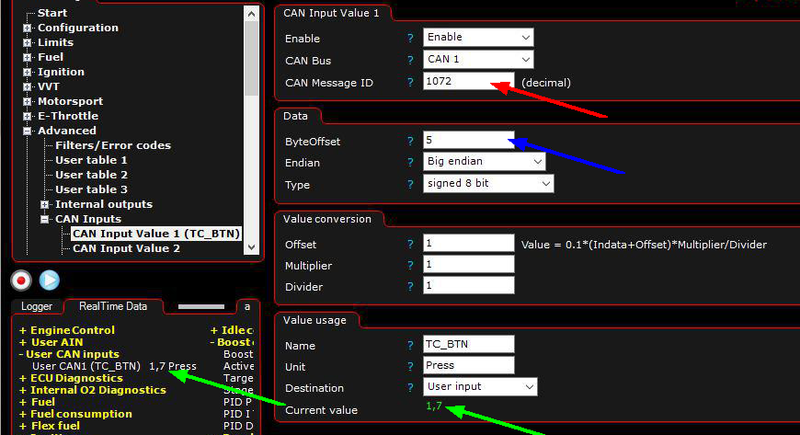 Vehicle CAN data can be used in MaxxECU for trigger certain functions, or log data if CAN ID are known. Enable or disables this function. Specifies which CAN bus to use (more than one CAN bus is only available in MaxxECU PRO). Message ID (decimal value) to be used. Byte offset to use. Example: second byte, offset = 1. •Big-endian is an order in which the "big end" (most significant value in the sequence) is stored first (at the lowest storage address). •Little-endian is an order in which the "little end" (least significant value in the sequence) is stored first. •Signed variables, such as signed integers will allow you to represent numbers both in the positive and negative ranges. •Unsigned variables, such as unsigned integers, will only allow you to represent positive numbers. Offset to use in the conversion formula. Multiplier to use in the conversion formula. Divider to use in the conversion formula. Note: see below current value top check your final value to be used in MaxxECU. Name of the converted value. Visible in MTune. Unit for the converted value. Visible in MTune. Value will be visible in RealTime Data --> User CAN inputs. Can be used in MaxxECU as any other RealTime value for conditions or warning. For example it can be used to read GPS SPEED from CAN and use as a wheelspeed input. The final value after all conversion, this value is to be used in MaxxECU. Defines which bits in the byte you want to keep, and which bits you want to clear. MaxxECU here uses bitwise AND in order to extract a subset of the bits in the value. To set the input, (value & bit mask) cant be "0" (>=1) to activate the MaxxECU digital input function below. (Bit is either "0" or "1", and 8 bits grouped together makes 1 byte). We can use the bit mask setting to "Query the status of a bit" in the byte value. In the below example, we have a certain byte which is changing from 149 to 157 when pressing the AC ON/OFF button. When we apply the above example settings in MTune to trigger the AC request/idle up function in MaxxECU, from the fourth bit in the byte value. Note: 0x430 is hexadecimal and it's the same as decimal value 1072.
to the sixth byte (D6) which has default value of 0x10 (hexadecimal). value was now changed to 0x90 (hexadecimal). Conclusion: When press and hold the Traction button, CAN ID 0x430, D6 byte is changed from 0x10 to 0x90. Red arrow: Enter the decimal value which we will use as input 0x430(hex) = 1072(dec). Blue arrow: Since the data we are looking for is in the sixth byte (D6) we will enter a byte ofset of 5 (skip the bytes before and just pay attention to the D6). using internal output or virtual inputs. Green arrows: Indicates the converted value from vehicle CAN when Traction button is pressed. counter, which then later is triggering the Disable traction input function. trigger the internal function Disable Traction control. Note: This was just a simple example of what can be made using the User CAN input function, a lot of more advanced functions can be made.